This spot reserved for Shea Owens. That's him with my daughter Whitney (He was her Bride's Man of Honor). 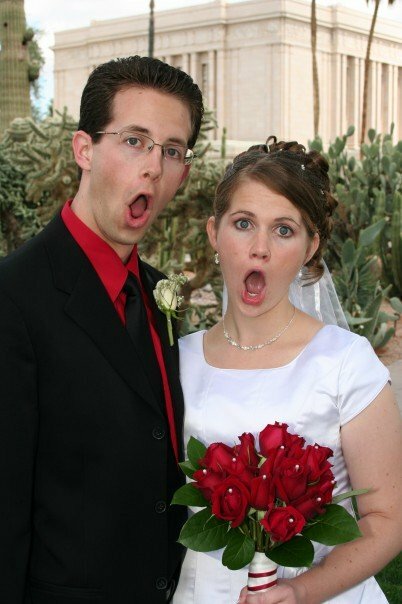 Yes, big mouths do run in the family! Alumni Spotlight: Ashley Anderson 2004: Ashley Anderson started taking piano lessons from me when she was 8 years old and continued for the next 10 years until she graduated from Paradise Valley High School (Class of 2002). She is currently pursuing a double major at NAU in Piano Performance and Choral Education. I asked Ashley to list some of her achievements as well as a few pearls of wisdom she could share with my students. Somehow, between all her rehearsals and practice sessions, she was able to find time to do this. Thank you, Ashley, for the amazing person you are and for the wonderful example you offer all musicians - young and old. You are truly an inspiration! 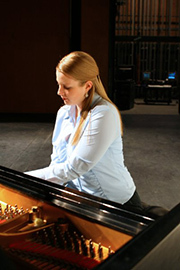 Achievements: Ashley has been the principal accompanist for the NAU Mens and Womens Choirs. This year she plays for Chamber Choir. She accompanied an AMEA choral festival last year and again this month and will be the official accompanist for the Southwest Regional Honor Choir in February. Ashley is also a sight-reading judge for the Northwest regional auditions. She says her favorite thing is Shrine (an elite choral performing group). Ever since her freshman year in high school, Ashley has wanted to be the accompanist for this group - - and now it's her second year doing it! According to Ashley: "It's the best part of my day. Dr. Copley is an outstanding director." Whenever they do an a capella song, Ashley joins them and sings alto. Shrine toured Europe last year where they did a performance of Verdi's Requiem in Germany. Ashley was able to accompany the four international soloists during their coaching session, as well as the four other soloists who performed it with the Flagstaff Symphony Orchestra - - professional vocalists from New York and other places! Ashley is employed as the accompanist for Children's Chorale of Flagstaff and is the official accompanist for many music majors at NAU - - 8 vocalists and 3 instrumentalists. On top of all this, she also takes voice lessons which "definitely benefits my accompanying skills". Ashley spends at least 3 hours a day practicing her own personal music studies. However, she recently calculated that she actually spends about 35 hours per week playing the piano! Here are some "Pearls of Wisdom" she offers: Do your scales and arpeggios! Surprise - - they make you play better! Sight-read everyday. It's a very handy skill, a necessary one. Start memorizing early so you're not afraid of it. Do what your teacher tells you to. You and your teacher will be happier. SING - - it will help you. Put your piano skills to good use besides playing solos - - accompany! Be punctual and responsible. Most important: Enjoy what you do and the fact that you can do it.